Walking boots, sunglasses, water bottles? Yes. We are ready for the Kings Canyon rim walk. A stiff breeze keeps us cool as we make our way to the start. I look up and point. “There’s someone climbing the canyon wall”. “No. That’s the path”, says Richard. Up we go. 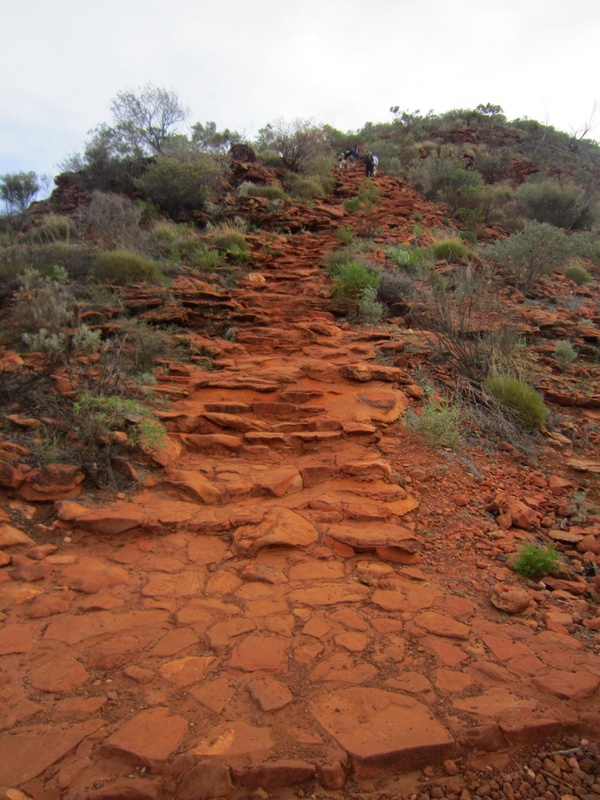 The track climbs almost vertically from ground level up to the rim. It’s steep, a five hundred step climb. Hearts pumping and slightly breathless, we get to the top. What a view. We can see for miles and miles across the spinifex plains. The rust red golden hues of the canyon surround us as we walk further along the rim. Massive rocks with tessellated angular surfaces like crocodile scales, loom ahead. Hardy white cypress pine trees force their roots deep into crevices in the rock to find water to survive. Palm like cycads sprout from rocky corners. 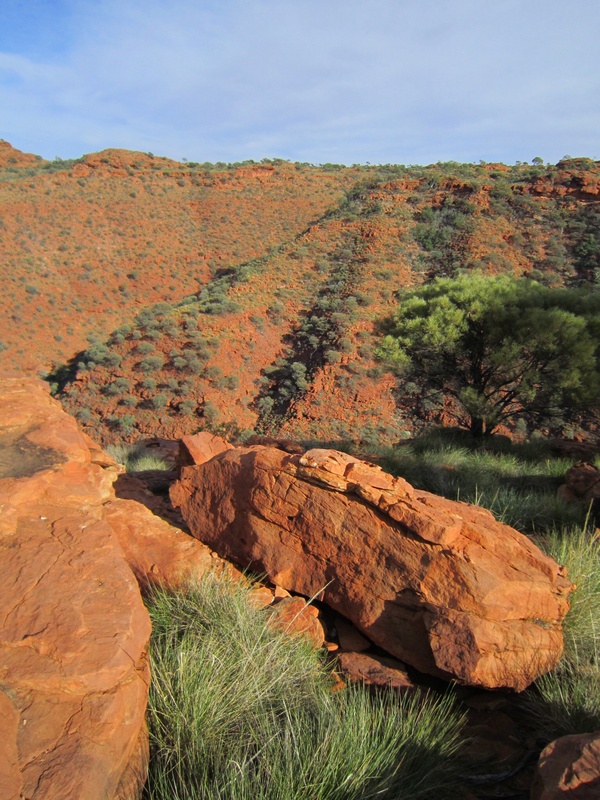 The rim has its own thriving ecosystem, including rock wallabies and euros. It is surprisingly green up here. The path takes us through a narrow space between two huge rounded masses of rock. We catch glimpses of strange otherworldly shapes on the other side. When we step through we are transported into a forgotten village of beehive shaped stone dwellings. The flat rock at our feet could be a man made pavement from ancient times. I touch the rock, to reassure myself that this is real, not a dream. Where are the ancient people who lived here? I see why the local people tell tales of a dreamland race who live here in the rocks. Red holly grevillea grows here in profusion. A beautiful plant, it has the delicate red flower of a grevillea and spiky, grey green leaves, shaped like holly. I lean down to touch ripples in the rock at my feet. They are cold and hard. I am touching the frozen memory of wind rippling the dunes that formed this sandstone. I am travelling in time. It is wild and windy. Cool bright weather like this is perfect for the walk. 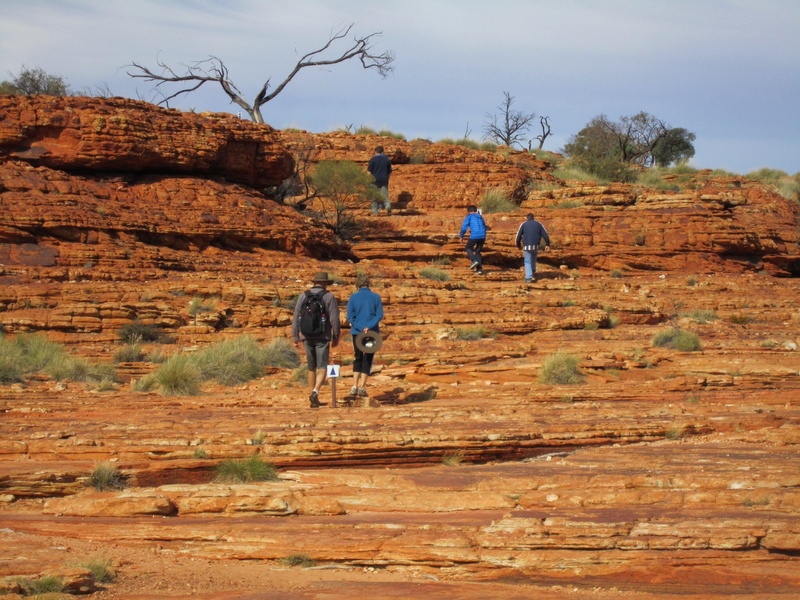 It is about six km walking on rocky surfaces with little shade. On a hotter day, the rock would reflect the heat of the sun and it could be unbearable. We are totally immersed in the world of the canyon rim. Everywhere we look we see the intense rust red colours and strange, awe inspiring structures sculpted by the wind and rain. I’ve never been anywhere like this before. The path takes us to the edge of the canyon and we walk down a black wooden walkway into the chasm. Below us we can see the creek. We look down on the tops of tall gum trees growing out of the lush green oasis created around the waterway. Birds are singing. They call this place the Garden of Eden. Climbing again to the other side of the rim, we catch a view of the walls of the canyon. The craggy rock has split through to form a wall that is flat and smooth, as if a knife had cut it. The heart of the rock exposed is paler than its craggy skin suggests. The flat walls are amber and white, contrasting with the deep red gold around us. Two small figures can be seen on a precarious rocky ledge opposite us. Some foolhardy tourists have diverted from the path and have clambered down on to the edge to get a better view of the walls of the canyon. I feel my stomach dip in vicarious vertigo. From our vantage point we can see that the rock breaks away beneath them and curves way back into the wall of the canyon. What madness. We walk on, way back from the edge. The flat rock catches the rays of the sun and glows. The camera will not be able to capture the intensity of the colours around us. We glimpse the view in gaps between the hard glinting surfaces of the towers of red gold rock. It is as if we are looking into the dreamland world again. We see a plateau apparently densely populated with stone villages from another time and place. The beehive shapes intrigue me. The walk begins to descend and we catch sight of the car park far below us. Gradually we climb down from the rim leaving that strange, beautiful world behind us. The red centre is a wonderland. Every day we are in awe of the land around us. Tomorrow we visit Uluru then Kata Tjuta. No doubt I’ll fall in love with them too. But it’s the landscape as a whole that inspires. Travelling long distances, I see the beauty in the ever changing shape and colour of this country in its natural state. It’s a rare privilege. Most of the landscapes we see have been so manipulated to our needs that we have lost this. We’ve lost the horizon. We’ve lost our connection to the natural world. I’m not suggesting that travelling in a car over long distances is the best way to get in touch with nature. Of course not. But the real attraction of the red centre for me has been the ability to see not just the tourist sights but the form of the land itself. Walk it, cycle it, drive it, fly it, it doesn’t matter. If you travel in this country you have an opportunity to see natural beauty without human intervention and on a grand scale. 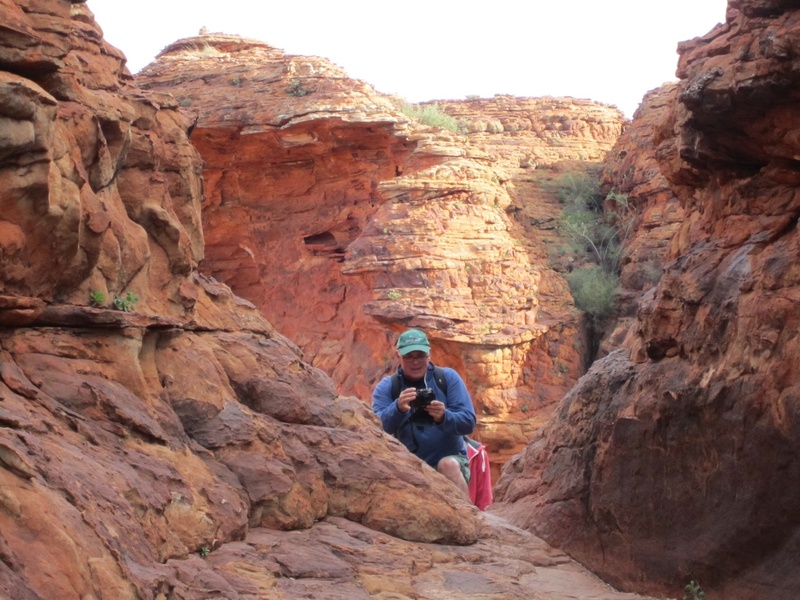 This entry was posted in Going home, Walks and tagged Australia, Kings Canyon, Outback, Travel, Walking on 09/06/2014 by Deb McSephney. Thanks Deb, it’s been fun keeping an online journal. 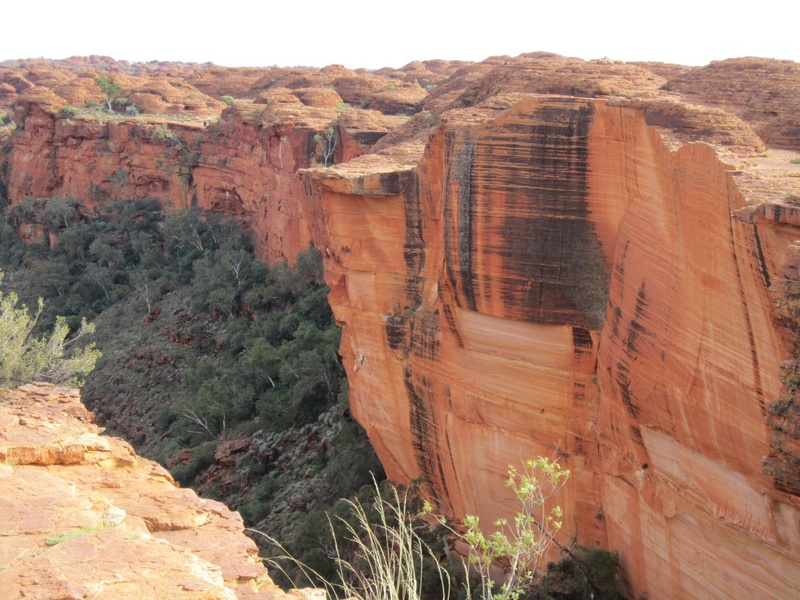 Kings Canyon is definitely one of the highlights.